Thorpe Mandeville Parish Council does not make any planning decisions. 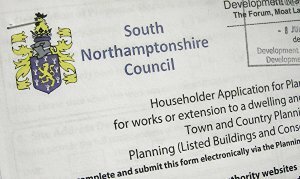 The Council is advised of relevant planning applications by South Northamptonshire District Council (SNC), the local planning authority, and it is invited to make comments. Comments from individuals are also welcome by the SNC. These should be submitted direct to the SNC within the time limit. The SNC looks to the Parish Council and individual parishioners for insight as part of its decision making process but it may not follow the submitted views. Planning Applications are normally discussed by the Parish Council at its scheduled meetings (see Calendar for dates). Discussion of current applications is a permanent agenda item for Council meetings. When the SNC's deadline for comments is before the next scheduled Parish Council meeting and the application is not deemed significant, the application is considered by the Parish Council's Planning Application Committee (Cllr Janet Ormond (Chairman), Cllr Ian Durham and Cllr Emlyn Lilly). All decisions made by the full Parish Council and the Planning Application Committee are recorded in the Council's minutes. The following summary has been extracted from the SNC website. It is not updated on a daily basis and therefore it may not be complete. The latest planning applications and detail regarding all applications can be accessed by this link to the SNC planning website. On the SNC website click 'Continue' at the foot of the page, then enter 'Thorpe Mandeville' in the 'Parish' box on the next page; clicking 'Search' takes you to the parish planning applications. S/2019/0234/FUL Received 1 February 2019. Replacement single storey extension. Loft conversion with enlarged window on front elevation. Remove chimney. 1 Dove Cottages, Banbury Lane, Thorpe Mandeville, OX17 2EX. Work on trees in a Conservation Area,Courts Farthing, Banbury Lane, Thorpe Mandeville, OX17 2EY. S/2018/2442/LDE Received 29 October 2018. Certificate of Lawfulness for Existing Development/Use comprising change of use of dwelling to private venue for hire. Thorpe Mandeville Manor, Banbury Lane, Thorpe Mandeville, OX17 2HR. S/2018/2279/FUL Received 25 September 2018. Two air source heat pumps. Court's Farthing, Banbury Lane, Thorpe Mandeville, OX17 2EY. Single storey rear extension, Merivale, Banbury Lane, Thorpe Mandeville, OX17 2EX. S/2018/0498/FUL & S/2018/0499/LBC Received 26 February 2018. Replacement of existing timber gates with metal gates to front boundary of the manor house parking area. Thorpe Mandeville Manor, Banbury Lane, Thorpe Mandeville, OX17 2HR.